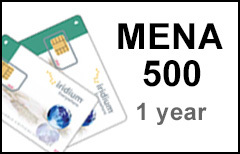 The Iridium MENA Plan features discounted airtime rates for subscribers calling from some African and Middle East countries. IMPORTANT! MENA plan will only work from the territory of the MENA Region (see below). The plan will NOT work from anywhere else! The plan can be used with any Iridium satellite phone.